The Supply Of Available New Homes For Sale Just Plummeted! The supply of newly-built homes for sales plummeted in April, a positive indicator for the Rancho Santa Margarita housing market as we head into the summer months. It’s no wonder that homebuilders are breaking new ground at the fastest clip in 2 years. 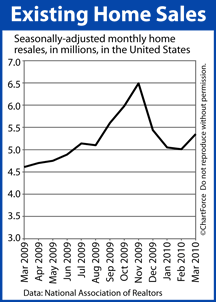 At the current sales pace, the nation’s complete supply of new homes would be sold in just 5 month’s time. That’s more than double the pace of a year ago. Also, as more good news, in terms of total housing units, the government reports that New Home Sales topped one half-million homes sold for the first time since May 2008. It’s a similar spike as within the Existing Home Sales data released earlier this week. But before we declare the housing market “repaired in full”, we have to consider a few of the reasons why home sales are charting so strongly. The first reason is the federal homebuyer tax credit’s April 30 expiration. In order to claim up to $8,000 in tax credits, home buyers must have been in mutual contract for a property before May 1. There is no doubt this contributed to a run-up in sales, especially among first-time home buyers. The second reason is that mortgage rates have remained exceptionally low, defying expert predictions. Low rates don’t sell homes, but they do make monthly payments easier to manage for households torn between renting or buying. And, lastly, March and April’s new home sales may have been buoyed by aggressive discounting on behalf of homebuilders. 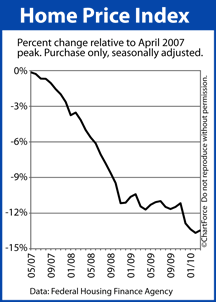 As compared to February 2010, April’s average new home sale price was lower by 13 percent. That’s a sharp drop in a short period of time. For now, though, homes are selling, supplies are dropping, and buyer interest is high. It’s no wonder builder confidence is soaring. Comments Off on The Supply Of Available New Homes For Sale Just Plummeted! Because of strife in Greece, Spain and North Korea, conforming mortgage rates are back to all-time lows. They’re at levels not seen in 50 years. For homeowners that missed the Refi Boom of November 2009, it’s a second chance. In this well-presented, 3-minute video from NBC’s The Today Show, you’ll get tips getting low rates and choosing the best time to lock in. Why were the experts wrong about rates moving higher this summer? How much money can you save with a 1 point drop in your interest rate? Should you buy a bigger home now that rates have fallen? The advice in the piece is matter-of-fact and centered. There is no cheerleading and the message is honest. Mortgage rates are low and they likely won’t stay that way. If you’ve been thinking about a refinance, talk to your loan officer as soon as possible. Comments Off on Should You Refinance Your Mortgage? Home values rose in March, according to the Federal Home Finance Agency’s most recent Home Price Index. Values were reported higher by 0.3 percent, on average, from February. 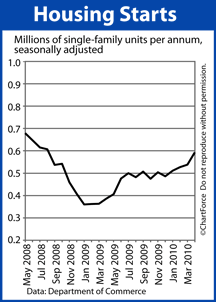 We use the phrase “on average” because the Home Price Index is broad-reaching, national housing statistic. It ignores the dynamics of neighborhood real estate markets like Orange County as well as citywide markets like Trabuco Canyon , too. Instead, the Home Price Index focuses on state and regional statistics. Of course, none of this data is especially helpful for today’s home buyers and sellers. Real estate is a local phenomenon that can’t be summarized by state or region. What matters most to buyers and sellers is the economics of a neighborhood and that level of granularity can’t be served up by a national housing report like the Home Price Index. 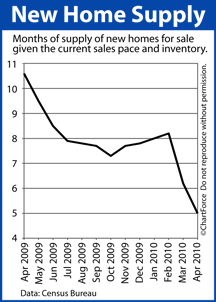 The Home Price Index data is additionally unhelpful to buyers and sellers in that it reports on a 2-month delay. In other words, Home Price Index is not even a fair reflection of today’s market — it highlights the real estate market as it existed 60 days ago. So why is the Home Price Index even published? Because government, business and banks rely on the reports. As a national indicator, the Home Price Index helps governments make policy, businesses make decisions, and banks make guidelines. This, in turn, trickles down to Main Street where it impacts every one of us — and eventually influences real estate. Since peaking in April 2007, the Home Price Index is off 13.44 percent. Another week, same old story. While the demand for mortgage loans to purchase a new home has declined following the expiration of the home buyer tax credit, mortgage applications overall, increased last week as home owners looked to refinance. Mortgage rates have reached their lowest levels since March and many homeowners are looking to refinance their mortgage loans. While falling home prices have reduced the popularity of refinancing to tap into home equity, low mortgage rates have drawn the attention of borrowers looking to reduce their interest payments. The Mortgage Bankers Association reported an increase in the number of applications for mortgage loans. The first week of May saw just under a 4 percent jump in applications from the previous week. With U.S. fixed rate mortgages hovering close to 5 percent, many homeowners jumped at the opportunity to refinance into lower mortgage rates. And with home prices starting to stabilize, the housing market is beginning to return to business as usual. In the past few years homeowners have seen tremendous volatility in the housing market, including some of largest declines in home prices in recent memory. Falling home prices have wiped out an unprecedented amount of U.S. homeowner’s equity, shaking up the mortgage business. With home prices showing more stability, borrowers and lenders can once again be confident that once a home is refinanced its value will most likely not fall below the mortgage balance. Some borrowers have even chosen to do cash-in refinances, putting more equity into their home to qualify for lower interest rates. Mortgage Rates Remain Incredibly Low. 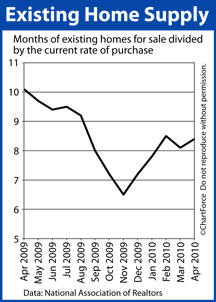 Despite the Federal Reserve ending it mortgage purchasing program, mortgage rates remain low. The Mortgage Banker Association reported that they were as low as 4.96 percent for the first week of May. While above the 4.76 percent they were this time last year, the sub 5 percent rates are still historically low. Many homeowners have been waiting for rates to once again dip down and as the trend of increased mortgage loan applications indicates they are swooping in to take advantage. In some lower price ranges, because values have nudged up over the last year, some homeowners who couldn’t refinance a year or two ago, now can – at historically low fixed rates! Look into it with your favorite loan person – I can recommend a couple of good ones. With home prices still relatively low and mortgage rates trolling near their all-time best levels, it’s no surprise that home affordability is extraordinarily high in Trabuco Canyon and most U.S. markets. According to the quarterly Home Opportunity Index as published by the National Association of Home Builders, more than 72 percent of all new and existing homes sold between January-March 2010 were affordable to families earning the national median income. It’s the second highest reading in the survey’s history. 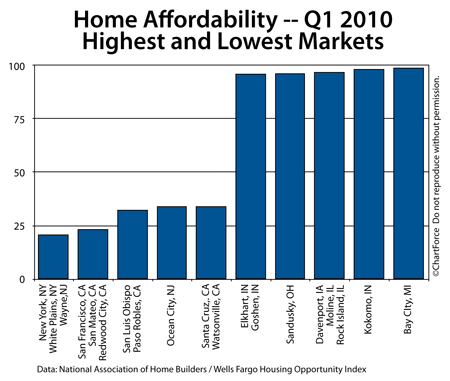 Of course, on a city-by-city basis, home affordability varies. In the first quarter of 2010, for example, 98.7% of homes sold in Bay City, Michigan were affordable for families earning the area’s median income and in Indianapolis, the percentage was almost 95 percent. Indianapolis has held the top quarterly ranking for close to 5 years now. On the opposite end of the spectrum, the New York-White Plains, NY-Wayne, NJ region earned the “least affordable” metropolitan area for the 8th consecutive quarter. Just 20.9% of homes are affordable to families earning the local median income. The rankings for all 225 metro areas are available on the NAHB website but regardless of where your town ranks, home affordability remains high as compared to historical values but it likely won’t last long. Home values are recovering in many markets and mortgage rates won’t stay this low forever. All things equal, buying a home may never come this cheap again. If you were planning to buy later this year, consider moving up your timeframe. After starting the day in the red, mortgage rates rebounded Wednesday afternoon after the Federal Reserve released its April 27-28, 2010 meeting minutes. It’s good news for home buyers and would-be refinancers in Coto de Caza. Mortgage rates continue to troll along multi-year lows. “Fed Minutes” are lengthy, detailed recaps of Federal Open Market Committee meetings, not unlike the minutes you’d see after a corporate conference, or condo association gathering. 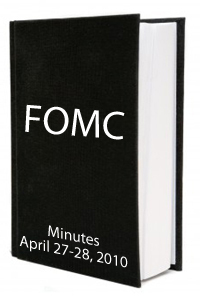 The Federal Reserve publishes Fed Minutes 3 weeks after each respective FOMC get-together. Because of the minutes’ content and density, it’s of tremendous value to Wall Street and investors. Fed Minutes provide a glimpse into the conversations and debates that shape the country’s monetary policy. The broad scope of the published meeting minutes are in sharp contrast to the more well-known, post-meeting press release which reads more like a policy summary. And the extra words matter. When the markets saw the Fed Minutes, what had been a down day for bond markets turned positive. The less-than-sunny outlook for the near-term U.S. economy sparked bond sales, pushing prices higher. Mortgage rates move opposite mortgage bond prices. Wall Street is always in search of clues from inside the Fed about what’s next for the economy and post-FOMC minutes usually give good fodder. April’s meeting was no different. For now, mortgage rates remain near all-time lows but once the Eurozone issues are settled, rates are likely to rise. If you haven’t locked a mortgage rate, your window may be closing. Once the economy is turning around for certain, mortgage bonds will be among the first of the casualties. Single-family Housing Starts rose by 55,000 last month, suggesting ample housing stock from which Coto de Caza can choose this summer. The report is a slightly larger read than what economists had expected. Furthermore, for the first time since June 2009, Housing Starts appears to have broken away from its half-million unit plateau. 593,000 new homes were started in April. Ordinarily, both Wall Street and Main Street would celebrate a strong housing sector report like this, but the Department of Commerce’s press release also held two cautionary notes. The first point of caution is a mathematical one. Although single-family starts increased by 10.2 percent, the survey had a Margin of Error of 10.7 percent. This means that Housing Starts may have fallen by 0.5 percent and the report is statistically worthless. According to the Census Bureau, 82% of homes start construction within 60 days of permit-issuance. Housing Starts, therefore, should ease though June and July. Home prices are based on housing’s supply and demand. For the next few months, supply should elevate, helping prices remain suppressed, after which, supply should dwindle. The best time to buy a home, therefore, may be now. As the summer months come to close, we may find that buyers vastly outweigh sellers.